"Go to the banks of the great grey-green, greasy Limpopo River, all set about with fever-trees, and find out." — Rudyard Kipling — The Elephant's Child — Just So Stories — 1902. It seems remarkable now, but it was five years ago that I travelled to South Africa. This was not my first visit to this beautiful country, but it was the first one where I had intentions of getting into some rivers to collect fishes. We based ourselves in Pretoria, the administrative capital in the north east of the country. Several trips were made and many fishes were encountered. For me, and collecting cohort Shane Linder, there was one stand out species and it is the subject of this month's article. Like the young and insatiably curious elephant in Kipling's story, we headed towards the Limpopo drainage. To be more precise: the Crocodile River which is one of the larger tributaries of the great Southern African river. The Crocodile River itself forms from three lesser tributaries. They join, like the prongs of trident almost at the same point. Once joined, the main river flows north to join the Limpopo main channel at and along the border with Botswana. Much of the Crocodile River flows through private land. Access requires permission or a stretch of the river that is accessible from the road. So, collecting fishes requires some homework and reconnaissance. After some of both, we found a nice spot and parked the Land Rover under an acacia tree - perhaps as much for shade as for a classic photo opportunity. We unpacked some nets, tubs and photo tank leaving the photographic kit in the car. Access to the river was comfortable through long, thankfully soft, green grass. The river was sometimes shaded by low trees but was mostly bordered by this grass. The river course was flowing fast and medium shallow only occasionally higher than my upper thigh. The current was strong enough to restrict movement to very slow wading or moving only on all fours: but not too strong as to sweep one away. Unless, of course, a slippery rock or distraction caused a lack of concentration - in that case, it would was flowing with sufficient vigour to take you for a ride. Collecting in this cool water might be initially refreshing, but it is tiring. It's also very hard work for one person and even as a duo. We collected one or two Chiloglanis at every second or third attempt. They live in head size or small rounded rocks that were slippery with golden brown mulm. Collecting them involved setting a net downstream of an area rocks to be kicked or pushed and then water was then strong enough to keep any fishes in the net. Worth noting here, that we found the tiny gravel huts built by caddis fly larvae all over these rounded rocks. It seemed to me a likely foodsource. Upon introduction to aquarium life, these fishes adapt to considerably less current and will eat frozen bloodworm at least. They are active during the day and can usually be seen searching for food in a less frenzied way than when it is actually introduced. Despite being a good aquarium fish, C. pretoriae is not exported for the trade. Such infrastructure doesn't exist in South Africa. Members of this genus are found for sale from time to time but have something of a reputation of being a bit delicate. In my opinion, this is partly because they can be confused with other more delicate suckermouth mochkokids, partly because they are treated like (but are not) algae eaters and party because they are not handled very well in transit. In the past year I encountered a trio of Chiloglanis for sale at Ferrybridge Aquatics in the North of England. They were clearly in good condition at the point of sale and have turned out to be a great buy. Lively and interesting, they almost give me hope of finding something out about the reproductive habits of this genus. Reproduction in these fishes is a mystery and is a subject which should not fail to attract the insatiably curious catfish keeper. Etymology Chiloglanis: From the Greek cheilos, meaning lip, and glanis, meaning catfish; in reference to the oral morphology. Pretoriae, a reference to Pretoria. Dark brown with small lighter patches on back and a distinctive series of verticle spots along body. Coloration is somewhat variable between populations. Turns a golden-yellow overall when stressed. Sexing Males possess a distinct genital papilla. Distribution Incomati, Limpopo, and middle and lower Zambezi, Pungwek, and Buzi systems. Other Parameters High oxygen levels. This fish greatly appreciates water movement and will always seek out the strongest currents in the aquarium. Feeding Live and frozen foods. Specimens kept for sometime in captivity may eventually take small amounts of flake foods. Furniture Occurs in shallow rocky reaches, riffle, and rapids. 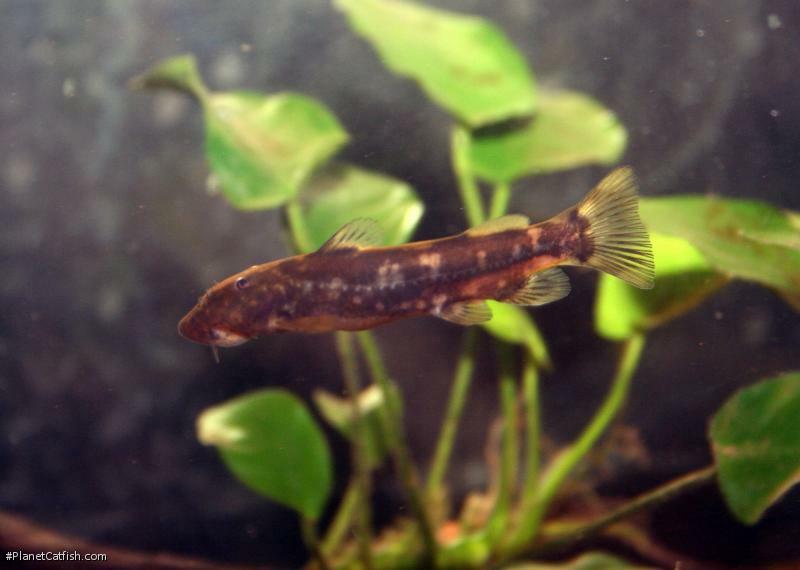 Fry are found along submersed vegetation along the river's banks. Suggested Tankmates Cool water cyprinids. References Skelton, P. 1993. A Complete Guide to the Freshwater Fishes of Southern Africa. Southern Book Publishers. 388 pp.